​​Children are our future, as they say, so why is it that 4 out of 5 car seats still are used incorrectly? The proper restraint for our little ones is crucial to their safety in the event of a crash. A child under 13 years old is involved in a car crash every 33 seconds, according to the National Highway Traffic Safety Administration (NHTSA). And car crashes are a leading cause of death for children ages 1 to 13. So what can we do to help keep our children safe while riding in vehicles? First things first, get familiar with Pennsylvania's child passenger safety laws (PDF). These are all primary laws, which means law enforcement can stop you for these offenses alone. Violators are fined $75 plus court costs and other fees. Fines collected are placed in a fund and used to purchase car seats for loaner programs. Children under 2 MUST be restrained in a rear-facing car seat until the child outgrows the maximum weight and height limits designated by the car sat manufacturer. Children under 4 MUST be restrained in an approved child safety seat. Children ages 4-8 MUST be restrained in an appropriate booster seat (which helps to align the seat belt correctly across the child's chest and lap). Children ages 8-18 MUST be in a seat belt. It's also recommended that children ages 12 and under should always ride buckled in the back seat because of the potential dangers associated with air bag deployment. Those are the laws in our state, but federal recommendations encourage parents to keep their children rear-facing until they are 3 years old. Every child is different, though, so you should choose a seat based on their age and size. Birth to 2 years: Always ride in a rear-facing car seat. Even if their legs seem cramped, they can always sit criss-cross, put their legs over the sides, or up the back of the seat. It's easier to fix a broken leg than a broken neck. 2-3 years: Remain rear-facing until your child reaches the top height or weight limit allowed by your car seat's manufacturer. 4-7 years: Remain in a forward-facing car seat with a harness until your child reaches the top height or weight limit allowed by your car seat's manufacturer. 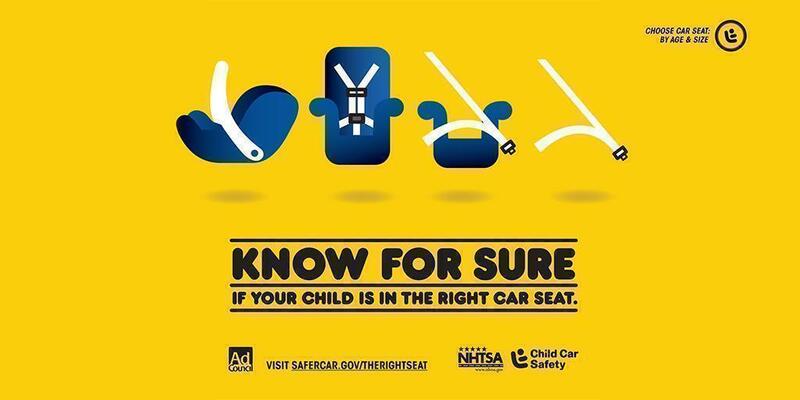 8-12 years: Keep your child in a booster seat until she is big enough to fit in a seat belt properly. For a seat belt to fit properly, the lap belt must lie snugly across the upper thighs, not the stomach. The shoulder belt should lie snug across the shoulder and chest and not cross the neck or face. If you are unsure which restraint system is best for your child, contact a local certified technician who can walk you through your options. Now that you've picked the right seat, make sure it's correctly installed. NHTSA offers several videos on how to install car seats, but there are local resources to help you ensure it's done properly. The Pennsylvania State Police always offer free car seat installations and inspections. Just call your local barracks to set up an appointment. If you aren't near a barracks, you can find a certified child passenger safety technician in your area by visiting www.pakidstravelsafe.org. The most important installation tip is that your car seat (at the base) should not move more than 1 inch. While proper installation is crucial, you should also make sure your child is correctly restrained in the seat. The belt in harness seats should be tight enough that you cannot pinch the fabric at the shoulders. Do not have children wear bulky coats while in their car seat during the colder months. Instead, keep them in the same clothing they'd wear around the house. If needed, drape the coat or a blanket over their lap. Straps when a child is rear-facing should be at or below a child's shoulders. Straps when a child is forward-facing should be at or above a child's shoulders. Finally, make sure you register your child's car seat so that you will be notified in the event of a recall. You also can check for recalls on NHTSA's website.